DURHAM, N.C. - April 21, 2016 - PRLog -- From the secular to the spiritual, Afro Cuban music and dance were rapidly growing in popularity in the U.S. by the mid-20th century. With the 1959 Cuban Revolution led by Fidel Castro, international relations were shattered, artistic freedoms ended and travel was restricted to the tropical island once known as America's favorite vacation spot. Six years ago, Leslie Cunningham, a Durham-based documentary filmmaker and the granddaughter of Tampa millionaire showmen Leon Claxton, created The Harlem in Havana Project, a transmedia project in honor of her grandfather's epic Black and Cuban traveling revue that braved racism, segregation and immigration laws to become popular in the 1940s through the 1960s. Leslie's father, John Cunningham, is a San Diego Latin percussionist and Leon Claxton's son. "Claxton got his dancers direct from the Tropicana Nightclub, one of the most famous nightclubs in the world! ", says John who was raised on the show and learned to play congas from some of the top Cuban musicians. At the Tropicana, Claxton discovered Mercedes Valdes, a Cuban Singer who specialized in Afro-Cuban traditional music. Valdes was one of the first Santeria singers to ever be recorded and often collaborated with music icon Celia Cruz. For the 1955 season, Mercedes Valdes was a feature act on 'Harlem in Havana'. Backed by famed drummers the Rodriquez Bros, Valdes wowed audiences with her interpretation of a Mythical Trip to Havana. In that same year, Claxton spiced up his chorus-line with four eye-catching imports- The Cuban Dancing Dolls. 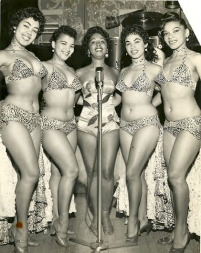 Flesh goddesses known as Las Diosas de Carne, The Cuban Dancing Dolls brought the rumba and early salsa party to American and Western Canadian Audiences. "How else can a girl see the world and get paid for it?" said Cuban Dancing Doll Susy Serrano in an interview with Jet Magazine, July, 1955. In the 1957 and '59 seasons, Claxton showcased top Rumba artist Pitucha Vega with her dance partner Mario Valdes, who had been with Claxton's revue on and off since 1941. Along with the other 30+ cast members of 'Harlem in Havana', the Cuban artists spent their days rigorously, putting on more than a dozen shows in a day, depending on the crowd. Pitucha was reportedly happy to have the opportunity to perform for mainstream audiences in the U.S. "I love the evening shows because then you get the feel", she said. At the end of the tour in November, the Afro Cuban troupes had to return to Cuba until they were able to get their visas renewed. A few artists, like Mercedes Valdes, found other commercial opportunities in the U.S. after leaving Claxton's show. After the Cuban revolution in 1959, it became increasingly harder to travel into the U.S. Some Cuban troupers defected on the trains somewhere along Royal American Shows' 25, 000+ mile show route between the U.S. and Western Canada. "That Castro has loused up a lot of things! ", said Leon Claxton in an interview with the Calgary Herald in 1961. "We were known all over the continent for 'Harlem in Havana'. It was a show name like Ringling Bros." That same year, Claxton buckled under the immense pressure to alter his show's name. In '61, Claxton presented the last and final iteration of his show, The Harlem Revue, with new cast members performing calypso, merengue and other forms of dance from the islands of Trinidad, Haiti and Jamaica. Although, the Harlem Revue maintained its standing as one of the leading outdoor attractions through the 1960s, Claxton's world-famous brown-skin revue would never be the same. "Harlem in Havana was referred to as a 'Jig Show'. The jig show was cornerstone of the carnival stage, but is often overlooked when recalling the contributions of the tenacious entertainers and brave show producers of colors who helped shape entertainment," says filmmaker Leslie Cunningham. Leslie aims to revive Harlem in Havana's rich history through thought-provoking content, including harleminhavana.com (the project website); Brown-Skin Showgirls (a photography book dedicated to the dancers from the show) and a feature documentary titled JIG SHOW | Leon Claxton's Harlem in Havana (jigshow.com) which will premier in the U.S. in early 2017, exactly 50 years after the show's last curtain call. Leslie is also working on a screenplay adapted from the documentary film. She is currently seeking funding to complete research and production in the city of Havana by late 2016. "When I started the documentary film project six years ago, the relationship between the U.S. and Cuba was still tenuous and travel to the island was at times unpermitted and other times strongly discouraged". Now that President Obama restored the relationship with Cuba, Leslie is planning to travel there and hopes to find more former Cuban troupers who performed on her grandfather's show. Ultimately a celebration of our multi-faceted past, The Harlem in Havana Project hopes to engage African Americans, Latinos and other communities of color who have been underserved in media and create a path for the descendants of African-Americans and Latinos to reflect, embrace, and liberate their own stories from historical amnesia. For information, visit http://www.harleminhavana.com or http://www.jigshow.com. JIG SHOW Production in Durham!